Tonight is a quiet night at home. So much fun with little Miss Annabelle today, who was so happy to see some of her little friends in art class today. My child has no fear of mess. It does not phase her to be covered in paint, goo, or soapy bubbles. That's my girl! At home we colored together with animal head crayons that were supposed to be a stocking stuffer (oops!) We played many, many games of Ring Around the Rosy, read many books, chased the cats. And tonight when I told her it was time for bed, she said, "Oh No!" haha. She went to bed just fine though. Welcome to day 26 of Art Every Day Month! We're in the home stretch folks. If you've missed a day or two or more, don't let that stop you from diving back in. There are plenty of good days left to create in this month! 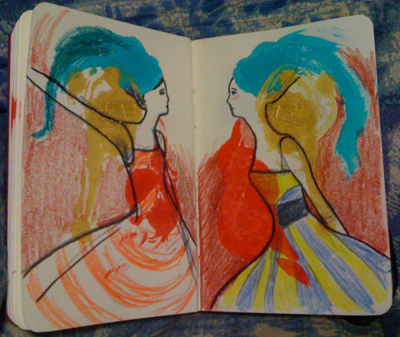 Twitter: If you're on Twitter (I'm on there as @leah_art), I'll be using the hashtag #aedm2012 to mark Art Every Day Month tweets. It helps to find others who are tweeting about AEDM! Instagram: You can use the same #aedm2012 hashtag if you're playing along on Instagram. Tonight, I played with some paints first and then let it sit. 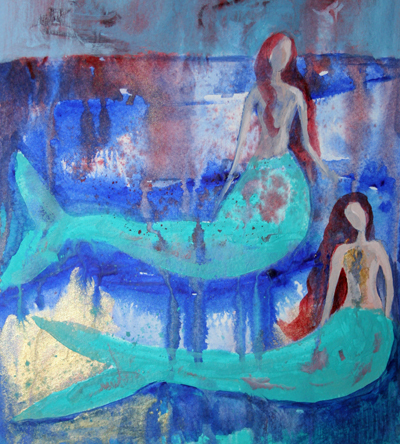 Andrew saw a mermaid tail in it first and I decided to run with it, painting these two mermaids in acrylic paint on paper. I hope everyone who celebrated had a wonderful Thanksgiving with family and friends! With my extended family, we'll be continuing the celebrations tomorrow. 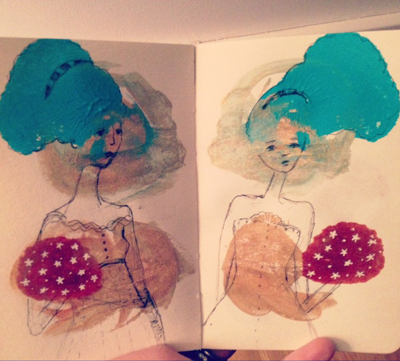 Yesterday, I did some inkblot art in a small sketchbook, leading to this image of two blue-haired bridesmaids. Perhaps they're the same blue-haired sisters that appeared in an inkblot last year! 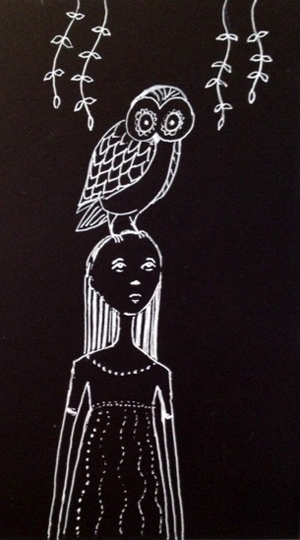 Today, I was doodling owls in my sketchbook and had the idea to do an owl perched on a woman's head. I'm calling it Sophia. In Greece, owls represent wisdom and seeing little owls in my head while breathing through labor is partly why I chose Sophia (meaning wisdom) as Annabelle's middle name. I wasn't thinking of my daughter with this image though, it was more of an outward representation of the brain. Tonight, I started this painting after dinner, while Annabelle was still awake and she was super jealous. She wanted to paint too! 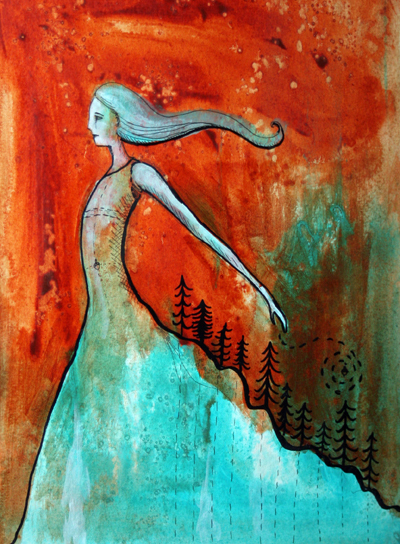 The acorn imagery appears in this painting as well, in the gut of the woman and also coming out of her hand over the forest blooming from her dress. I will be away tomorrow, so I most likely won't post my art from Thursday until Friday (the daily posts will still be up.) I hope those of you in the States have a wonderful Thanksgiving! A piece of intuitive art today. Playing with paint on watercolor paper, this is what came out! Tomorrow, I leave for a few days away with family. The daily check-in posts will still be up, so you can share your work, but I won't have my laptop, so I won't be able to post my work until I return (Sunday.) If I can connect to the internet on my phone, I will be sharing my work each day on Instagram! And I'll be able to check my email occasionally. Good luck with your creating, everyone!! I wanted to make a Demeter counterpart for the Persephone in Autumn piece I did earlier in the month. Again, I started with collaging the background in the early morning hours and then painted the figure during Annabelle's afternoon nap. Again, I included a female figure in her face, which ended up getting painted over, but you can see a simple, young female figure (representing Persephone) in her hair. After I thought the piece was finished and I took a picture for Instagram, I noticed what looked like a bird shape in her hair, so I brought that out a little bit. It seemed right. 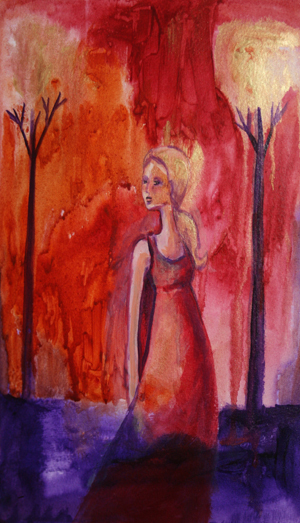 I wanted this piece to show Persephone while she is missing her daughter, wondering where she is. Stopping for a moment to hold her in her mind. I painted it with acrylics, on top of collage on a 6"x6" panel. By the way, if you have any interest in purchasing an original or print of the pieces I've created this month, let me know! Most of them will eventually make their way into my shop, but you can snap them up before that, if you'd like. Just pop me an email to discuss. 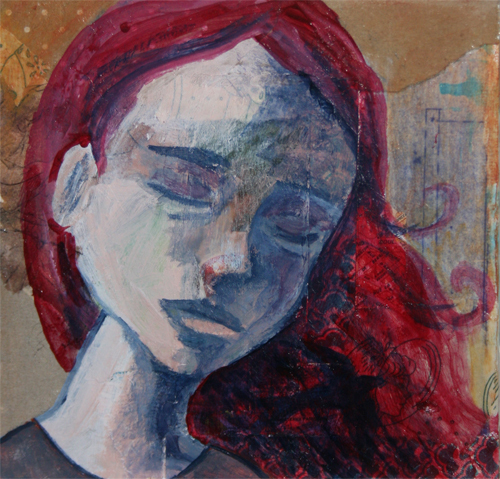 One of this month's pieces, Potential, has already sold! Today is day 13 of Art Every Day Month! I wish I had more time in the day for visiting all of you. What I've seen has blown me away. Anyone know a way to stretch time? You are all wonderfully creative, even if you don't realize it. I'm not even sure where, but somewhere today, I saw an image of a whale and had the urge to paint one. 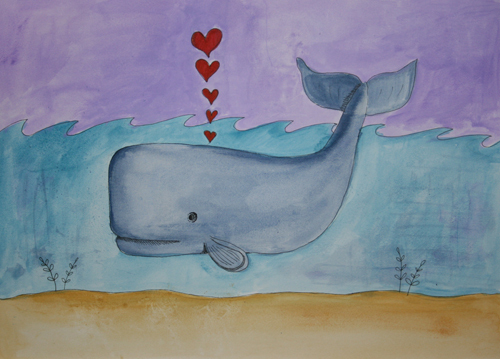 Working with fluid acrylics on watercolor paper, I painted this whale, spouting some love. Weekends seem to be just as jam-packed as weekdays around these parts, but it was fun! 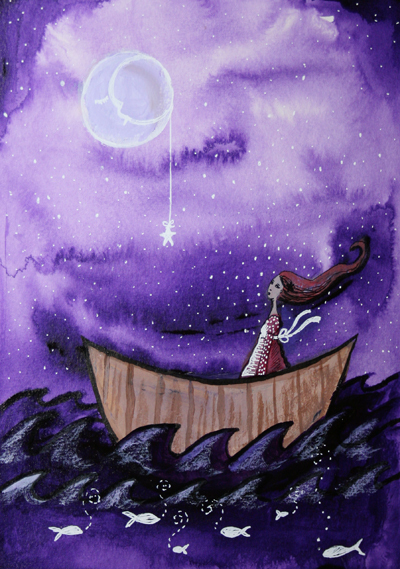 Today, I started with painting color on a wet sheet of watercolor paper and then let my intuition be my guide as to where to take it. 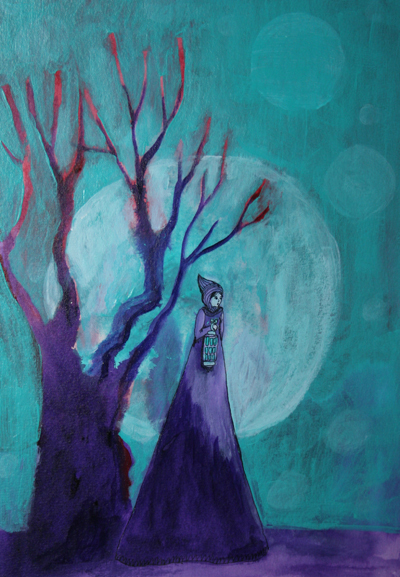 It turned into this woman carrying a lantern full of blue light.